Pinaud Lilac Vegetal is a perfume by Clubman / Edouard Pinaud for men and was released in 1880. The scent is floral-animal. It is still in production. So, to go to the alone to muffle all ok.
As a self-confessed fan of the Pinaud Clubman series, all of which have not without reason defied all adversities and landed in the modern age, I am for the first time unpleasantly surprised by what smells towards me from the plastic bottle. Yes, it smells musty, so peculiarly musty after past floral fragrance. First of all, it should be noted that PC Lilac Vegetal should and can be used as After Shave and Bodysplash and it is not an EdC or similar, so the fragrance property is rather secondary. However, after shave offshoots of many colognes and eau de toilettes have been adequately reviewed and discussed here and legends of shaving passions have left their mark on many of the perfumistas. For the rest of our lives we like to remember the warmth, the freshness, the spice or anything else that radiated from Daddy's little water and that makes us all crave the security of days long gone. And before man knows it, man becomes a vintage nostalgist and reaches for everything that suggests to his nose the faded splendour of the good old days. Legend has it that Eduard Pinaud designed this shaving lounger over 150 years ago for the Hungarian hussars, so that they could probably court the ladies in their dashing dress uniforms when they didn't have to gallop all over the Pusta. I can well imagine that the ladies of the time must have fled as well, as if the sons of Pusta on horseback had blown their attack at a straight gallop with their sabers pulled out. With the force comparable to a cavalry attack, the musty lilac from the bottle slams into my face, taking my breath away. The sweet musk probably took a detour through the urinal and I smell as if neighbor Lumpi had peed under my lilac tree. Neighbour's bawdy Lumpy, though. In fact, for me a strange undernote of Pippi is perceptible, which excuses me at - please! - the flats of old single ladies or old people's home corridors remind us: the lilac bouquet has stood 1 1/2 days too long in the vase, the furniture steams dusty mist out and sharp WC cleaners and urine mist do their best to add to this unpleasant melange. Even if I should be gracious, tolerant and indulgent, with such a long-lasting product, here for me the boundary between smells good and smells no longer fresh is clearly crossed. The silage is mediocre and the spook after 3 - 4 hours also thankfully over. 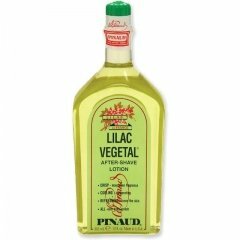 To get a foretaste of your own decay and finiteness of being after shaving, Lilac Vegetal is certainly o.k., but who wants that?! This lilac has nothing in common with the wonderful world of a lilac tree in the Maisonne. Just, what do I do with the other 350 ml now? Yes...beautiful lilac scent with cabbage. That's what it smells like to me, and a bit of musk in the mix. That is about it here. This isn't a big complex fragrance. I wore this several times, trying to decide if I loved it, hated it or something in between. I decided I loved the lilac part, and hated the vegetal part. Sadly, the lilac was gone on me within the hour....the vegetal took longer to go away. I respect that it is a truly long lived fragrance, and I tried to find the beauty in this one, but I just couldn't. Still, it's worth trying just once for the novelty of the scent. The Veg takes no prisoners and suffers no fools. You are either chosen by the Veg or you are not. There is no middle ground. I am chosen.